Fresh bamboo shoots make incredibly flavorful, clear soup with a few ingredients. The flavors in this soup come straight from the freshness of bamboo shoot and chicken. The natural sweetness comes from fresh bamboo shoot, not sugar. With fresh bamboo shoots you can play around with shapes. They are easy to cut out and will please the smallest members of your family. Children tend to eat more or at least try their favorite shapes. I can attest that a heart or bunny actually tastes better than a rectangle or round piece. Chicken bones are the key to sweet and flavorful broth. 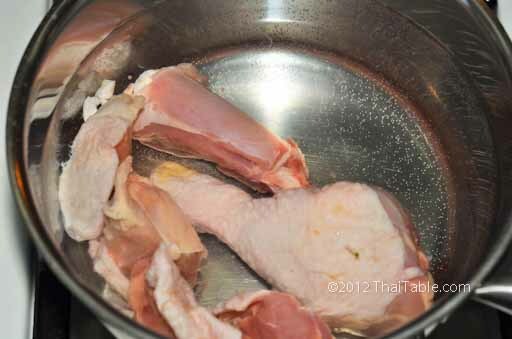 You can use boneless chicken breast but add some bone pieces like leg or thigh or even breast bones. This soup is my grandmother's recipe, simple and easy to make. It relies on the freshness of the ingredients. Many people add ground peppers to this soup but I love my grandmother's recipe's flavor and simplicity. This Fresh Bamboo Shoot Soup is a very simple soup to prepare. Over medium heat, add 4 cups of water to chicken pieces. Let the soup come to a boil, turn down the heat to a simmer. Hard boil will make the soup cloudy. Peel the outer dark layers off from bamboo shoot until the off-white shoot remains. I started with 10-ounce bamboo shoot and ended up with 4 ounce bamboo piece. Cut the hard tip off. Rinse bamboo shoot in cold water. From this point, the whole piece is edible. Trim shagged side away and save it for the soup. Cut bamboo into 1-inch thick cross sectional. Press down your cookie cutter. Remove the scraps and cut them small to add to the soup. 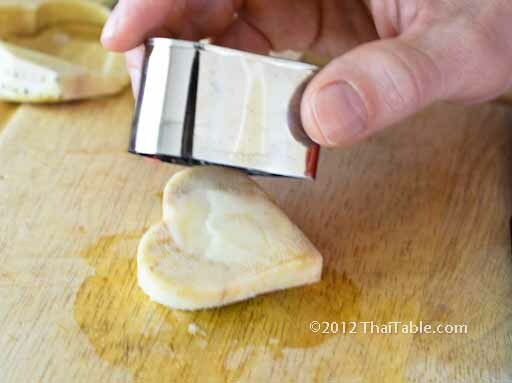 Take the cutout heart and slice thinly. Add the hearts and scraps into the soup. Let the soup boil for 30 more minutes so the flavors can blend in. 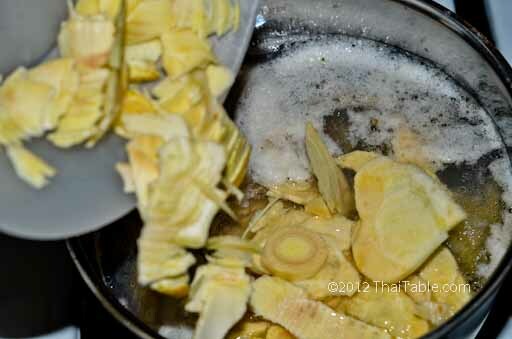 You can even simmer the soup longer and the bamboo shoot will stay firm. The soup should be full of chicken broth flavor with sweetness from fresh bamboo shoot. The bamboo shoot pieces should have a crunch with smooth texture. 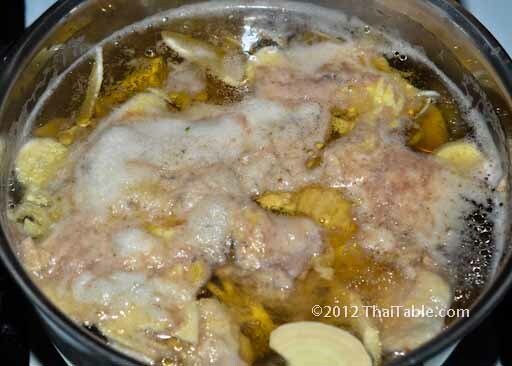 Fresh Bamboo Shoot Soup is a great complement to other spicy Thai dishes. Serve hot, with rice and other Thai dishes.